I just wanted to write to say thank you for opening my eyes. I watched your documentary and the next day went below 100 carbs per day. In 3 months time, I have dropped 25 lbs. It has changed my life. My wife has also followed your way of eating, and has lost 40 lbs. We are grateful for changing our lives. I understand how my body operates now, and If it weren’t for you, I would be on a path to destructing my body. Please keep us informed of any new movies, books, etc. Thank you again. Outstanding, Mike! Between the two of you, you’re 65 pounds lighter. I’ll bet mentally you feel you’ve taken a load off too. The mom also said she supposes the teacher thinks their family is nuts. That’s probably what they think about our family too, Mom, but we’re the ones whose kids are getting straight A’s. 112 pounds gone — wow! T-Shirt Size: Large (first time I’ve worn a ‘large’ shirt since probably 7th grade). I’m down 112lbs which is cool, but it has enabled me to do so many things that are much more exciting than simply losing weight. I recently started running last month to prepare for a school sponsored 5K (trying to motivate my students to get off their butts too), and I won my division. I think it is the first time I’ve ever “won” anything athletic before. It felt pretty good. Thank you for your help. I am extremely grateful for what this experience has done for me, and I wish there was a way for me to help others or “pay it forward” (yes… just like that Kevin Spacey movie). You already have paid it forward, Phil. I’m sure your students have noticed the change, and I’d be surprised if none of them ask you how you made it happen. I just wanted to let you know that your documentary has inspired and changed my life. This is not a story about how I was 500 pounds and lost half my body size (the heaviest I have ever been is 130 lbs at full-term pregnancy). I was 105 lbs when I first saw your documentary (I’m 5’2″). For my whole life, I had basically eaten a carb-based diet. I would consume plates and plates of rice (I would be mysteriously starving an hour after shoveling in enough to feed 5 people). I had heard a few people say that carbohydrates were bad, but NO ONE HAD EVER EXPLAINED WHY the way you did. You made me understand what this was doing to me on the INSIDE. I have made everybody I care about watch your documentary, including my daughter (she is 11). By the very first week of switching her over to 1 Jumbo, medium-boiled egg and 2 slices of bacon in the morning, she noticed that when it came to snack time in school, she was not starving at mid-morning as she had been when she breakfasted on cereal. By the second week, I also noticed that her chronic morning sneezing (doctors say I’ts rhinitis) had dramatically decreased. She still sneezes some, but I would say about 30%-40% of what it was before. Is it a coincidence? Maybe. But seeing a decade of chronic sneezing finally decrease right after a simple change in diet, I think not. We have also incorporated an hour of exercise into our lifestyle (in addition to the 45 minute walk from school). Again, my focus was not precisely weight loss, but my body has found a new balance at about 97 lbs (3 lbs over my pre-pregnancy weight), but with much more muscle tone and less visible fat! I get a great deal of satisfaction when people that I have introduced your movie to tell me that they have also shared it with others. Thank you so much for opening our eyes so that we can make INFORMED DECISIONS. If I’ve said it once, I’ve said it at least twice: this isn’t just about weight loss. It’s about health. Weight loss is a nice side-benefit of becoming healthier if you were overweight. 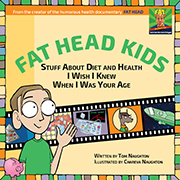 I’ve emailed you a couple of times to express my gratitude, and posted on the comments section of your blog a few times over the past year or so since I first watched “Fat Head” on Netflix streaming last March. I was a chubby little kid until my last couple of years of high school when a little diet and exercise, coupled with the last few inches of vertical growth I would ever experience, helped me to graduate looking fairly trim, if leaving something to be desired in the way of lean muscle mass. My older brother had followed a similar pattern a few years before me. The Summer of 1991 between my high school graduation and my freshman year of college, I put some weight back on by blowing off any kind of exercise, availing myself of the veritable smorgasbord of fast food that wasn’t available in my home town when I was growing up (though it is now, for better or worse), and indulging in the typical extracurricular activities one tends to do when they first get to college. By the Fall of ’91, I’d put on something of a gut, but I didn’t really worry about it. I figured it was my God given right to blow off a bit of steam at that point in my life and enjoy my new found freedom without responsibility while it lasted. 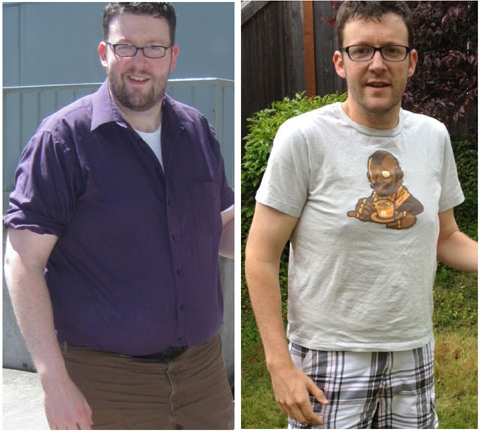 I’d go on a diet and take up walking/jogging again and drop the weight I’d picked up that summer, no problem. But there was a problem: It wouldn’t come off. It kept getting bigger, even as I tried starving myself on something like 1200 calories and 10 grams of fat a day and walked to the point of exhaustion, it wouldn’t come off. Not in any dramatic way, at least. I’d lose a few pounds, sometimes even enough that people would notice, but the low fat-low cal diet I was convinced I was supposed to follow was just too punishing. I was hungry all the time, and I’d get these erratic swings in energy that I now realize was my blood sugar going up and down like a roller coaster, an old wooden one, all shaky with a lot of steep drops. I could never keep it up for long, I felt like these diets were killing me, which might have actually been close to the truth. I was weak and tired all the time, and I hurt all over. I’d ultimately have no choice but to throw in the towel. Some time would pass, and I’d try the same thing again, rinse, repeat. 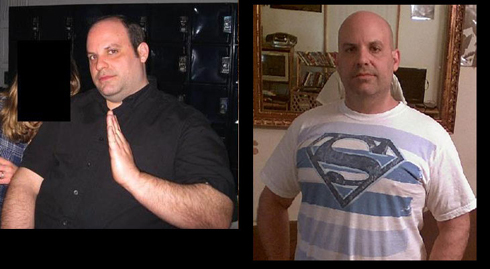 This horror show continued for an agonizing fifteen years until I tipped the scales at around 270lbs (I’m 5’6″). Then a few years ago, a friend and I joined a gym, and started meeting for weight training three times a week. This yielded better results that I’d seen up to that point, and since one can’t really accomplish much at weight training without adequate protein, I thought to cut the low-fat snacks out and go heavier on the meat. I was still doing the whole grain cereals with skim milk for breakfast and stuff, but at least the Snackwells cookies and Baked Lays were gone. We did that for a while, it worked up to a point, and then we eventually quit going to the gym and all the weight came back. Then, in the summer of 2010, I had to go down to TX for a friend’s wedding. I felt hot and bloated and miserable the whole time. When I got home, the first thing I did was throw out all of my junk food and clean off the weight bench I’d bought a year or so before but rarely used. Probably for the first time in all this mess, I had some idea where to start. I’d learned a lot working in the gym with my friend a few years earlier, and I’d figured out that the so-called “healthy” snack foods did not help. It was either meal time or it wasn’t. I hit the weights and cardio like a freakin’ beast and it showed. The keg I was carrying on my stomach became a pony keg in fairly short order, and my energy levels improved dramatically. But I still had a few things wrong that were holding me back: 1. I was still afraid of fat, buying the Laura’s Lean Beef, turkey bacon, and Egg Beaters. 2. Forcing whole grains into my diet even though I didn’t really even want them, but felt I was supposed to. Then last March I watched Fat Head on Netflix, and immediately got it. I immediately threw out all the cereals, oatmeal, and breakfast bars and went out to purchase real eggs, real bacon, and to tell “Laura” to take her overpriced, questionably labeled product and cram it as I replaced it with regular 80/20 ground beef. As a result, my waistline has been shrinking slowly but steadily ever since, apart from the break from my regimen I took between Halloween and the first of the year. When I cleaned out my closet last summer, I found a pair of jeans with a 46″ waist. At the time, I was wearing 36″ relaxed fit jeans. Now, it’s 36″ regular fit. I’m not gonna get all weepy and emo on you, but I just have to thank you again for putting the information out there for people like me. I see now that my problem was insulin resistance and erratic blood sugar levels. Now, if I get hungry, it’s not a light-headed queasy sort of hunger like I used to get. I can work on an empty stomach for hours with no problem. But for now, I’m just happy to have that long nightmare behind me. I’m thinking of starting a blog or something to help spread the word to others who might be going through the same crap I did. Maybe I can catch someone before they waste all of their 20s waddling around all fat and pissed off like the Stay Puft Marshmallow man. I’ll keep you posted. Yeah, I know that “if only I’d known this stuff 20 years ago” feeling really, really well. But better late than never. Ditto all that has been said from me too 🙂 My before and after pics are on my blog under “My Story”. It was after watching Fathead that the penny dropped for my partner and I and then reading Wheatbelly gave us final shove! Thank you again Tom. I recently watched your movie and I loved it. Thanks for a great movie. Incidentally, I disagree with you when you said Spurlock didn’t follow his own rules. He did say he would “eat everything on the menu.” I think he meant he would eat everything on the menu every day. Excellent! And hopefully it can only get better – this from this morning – finally, I think the message is getting out there…. I don’t want to make too much a young boy’s writing, but I think a common problem is to consider differing scientific views as different opinions. There are different *interpretations*, based on biases, pre-existing knowledge, etc, but there is still wrong and right. Colin Campbell doesn’t have a “different opinion” on diet: he is plain wrong. Agreed, but what we had here was a third-grader being polite. Thank you, Tom, for sharing these emails on your blog. They are waaay too good to keep to yourself and they are so inspiring. Please post more every so often as I know readers do enjoy hearing about success stories. All types of people benefit from the knowledge of how the body operates and once they know, they will never be the same. Yeah, it would have been nice to have known all this sooner, but I know to get to where I am at now, things had to go the way they did, struggles and all. I finally got over feeling as if posting the emails constitutes shameless bragging. If readers enjoy them, I’m happy to post them. Tom – Once again thanks for posting these stories, they are all inspiring. 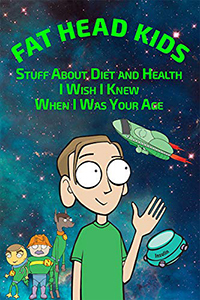 I agree with the “if I only knew 20 years ago” I could have avoided 20 years of yo-yo dieting myself. I’m now working on my friend’s 23 year old son – I gave him Fathead last night to watch. Fingers crossed for the next generation. At least he’ll have the information we didn’t. Whether he acts on it is his choice. 2. Place meat between slices of bread. 3. Remove meat from bread and throw the bread away. Things I’m ok with …………. I’m 64 – no getting around that. I still need to drop ~15 lbs to reach a “healthy BMI”. I’m not as active as I should/could be. I wish I’d know all this forty years ago! But while friends/family in my age group seem to be declining, I’m holding my own, getting off 5 of the 6 Rx meds I was on and being ~60 lbs lighter than my highest weight. So I’m ok with the rest. Being okay with the rest is a healthy attitude. I love to read about others stories! I especially like the ‘Card Carrying Fat Head’ idea. So inspiring and motivating! The groundswell continues. Wonderful as always to read about folks who have seen the light and found the way of eating that suits the human body!!! On a downer note: the grocery stores in my (albeit small) town no longer sell any ground beef but LEAN. And the butcher told me last week he doesn’t sell pork side ribs – “people don’t want the fat” so he’s selling back ribs only. It’s starting to get scary. Fry some bacon, save the grease, mix with your burgers. I will be watching “FAT HEAD” tonight for the first time. After all the reviews, iv’e got to see what the fuss is about. I already play with the low carb way of life. I say “play” because i give in when it gets too hard AND i KNOW it probably get’s too hard when I’m doing it wrong – anyho…looking very forward to the movie. I second the comment about sneezing. After watching Fat Head and then reading more, dramatically cutting carbs only caused me to drop about 30 pounds. But that 30 pounds put my BMI a little under 22 (I know BMI is BS, but it still illustrates the point that I didn’t need to lose a lot of weight). Meanwhile I used to take Claritin every single day to make my allergies bearable, I slept with a big container of Tums beside my bed and I had trouble with painful cracked heals, especially in the winter (cracked heels are a sign of insulin resistance). Even if cutting carbs didn’t result in any weight loss it would have been well worth it as an excellent treatment for allergies, heartburn and cracked heels. Also, even though my fasting blood sugar was still healthy, I’m in my early 30s. Increasing problems with cracked heels, a growing belly and a horrible Triglyceride to HDL ratio indicated that I was headed towards some much bigger problems if I hadn’t changed my diet. Sugars and grains do a lot more damage than what we see in the mirror. Absolutely. The mirror only shows the outward expression of internal problems. I sent Tom this email a couple of months ago, I think. Quick update, now I’m down to 34″ relaxed fit jeans and yet another notch in my belt. I’ve had to deal with some wicked plateaus in the past, but I’ve even figured out a way to “game the system” there in the past couple years. Frankly, a holiday season layoff (between Halloween and New Year’s) slows my metabolism back down and causes me to put on a little “Winter Weight”. Then, as I get right back on track after the first of the year (No putting it off! ), I burn right through that Winter Weight and keep right on going through the Spring. I’ll start to plateau again late in the Summer, but by then it’ll be almost time for my last quarter break again. If this keeps working the way it has for me the past couple of years, I might end up crazy fit by the time the big 4-0 rolls around. Get yourself a meat grinder, a manual one is really cheep on-line. I complained on a lean ground meat at my local natural food store, and they started to give me for free their fat that they cut from the grass-fed meat to throw is away. I add ground fat to mine ground meat now, what is left I make into a beef tallow. If you add some fat saved from frayed bacon or a tallow to your burger meat, most of it will just melt run away during cooking. Before getting your meat grinder you can also cut half-frozen fat into small cubes (or cut frozen bacon fat strips with scissors) and add it to the ground meat, but it is more time consuming. I love all these stories. My nanna passed away last April at the age of 96. She still spoke czech and she cooked according to the old czech style. She taught me a couple things that I now believe explain how she reached 96 in spite of having multiple heart attacks, likely from eating plenty of cakes, pies, and cookies. 1. When I was little and she was still very active, I always remember a 5 gallon bucket of lard in the kitchen. She used butter and lard in her baking and was generous with both. 2. Unlike my mother she never drained the fat from the hamburger. You fry the hamburger until the fat disappears and its browned. She had many tricks like this. I remember her telling me about the Great Depression. She said she didn’t think it was that bad. I’m guessing thats because she was always dirt poor growing up. She told me about eating Lard sandwiches. bread, lard, bread. God I miss her. A lard sandwich … now you’ve got me thinking how to make one with no bread. Ditto about the allergies, too. I used to go through rolls of paper towels in the Spring. I simply don’t get them anymore. Coincidence? Not sure. But it seems unlikely. Using your “Science for Smart People” talk as a template, and unlike the BBC et al, I actually read the paper. it turns out that when you take a mouse (not a person) and genetically alter it to have a problem with digesting fat.. it has a problem digesting fat. Who’dathunkit? (The study makes clear that “wild mice” do not have this problem – let alone humans – but nevertheless decided to conclude that saturated fat was evil anyway). Thank you for priming me with the confidence not to be cowed by such papers and to be able to see through them to their illogical cores. Glad to hear you’re asking those critical-thinking questions.